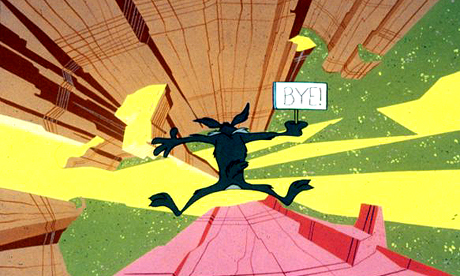 Bicycle lanes that begin and end in isolation are as effective as the cliff for Wile E. Coyote. Cities need to reconsider the importance of bicycling. Similar to a quality transit system and city street network, connectivity is critical. Bicycle lanes that begin and end in isolation are as effective as the cliff for Wile E. Coyote in the old Road Runner Looney Tunes cartoons. Trail networks and bicycle lanes must have many points of ingress/egress that are connected to other bicycle lanes, trails or streets that are calm enough for bicycle traffic. Colorado Springs is in the process of improving its bicycle connectivity with the implementation of “sharrows.” Sharrows are streets with bold signage painted on the surface of the street to indicate that vehicular traffic shall yield to the cyclist. The word “sharrow” is short for “share the road”. This is a great step in connecting Colorado Springs with the use of the bicycle and decreasing our dependence on the SOV (single-occupant vehicles). Equally important to the bicycle lanes, is the need for safe, visible and often sheltered bicycle storage facilities. Fort Carson, directly south of Colorado Springs, has become aggressive in including large bicycle storage pavilions outside of the new barracks on the Installation. This is a critical component of making the Installation bicycle friendly.